At an Extraordinary Meeting of Buckingham Town Council on Monday 4th February, called because of time restraints on the responses, Councillors considered two proposals for new developments in the town: an outline plan for 420 houses on land south of Osier Way behind Gawcott Fields, and amended plans for the Tingewick Triangle land at the junction of Tingewick Road and the bypass. The difference between the approaches of the two developers gave a clear example of the best way to develop new housing plans for the town. The development at Osier Way was opposed by Councillors; the site was not marked for housing in the Buckingham Neighbourhood Plan and fell outside the settlement boundary, separated from the town by the industrial areas and the bypass, and had no community facilities beyond open space and play areas. Councillors are concerned that this proposal would result in a dormitory estate which would be isolated from town life. In addition, the proposal assumed that residents would work locally and walk or cycle to work or school. However in reality there is little likelihood of taking small children to school in any other way than by car, making the parent-car problems at the primary schools even worse than they are now. Shopping trips to Tesco, Lidl and the town centre would also add to the traffic in and out of the site via Osier Way and the bypass. 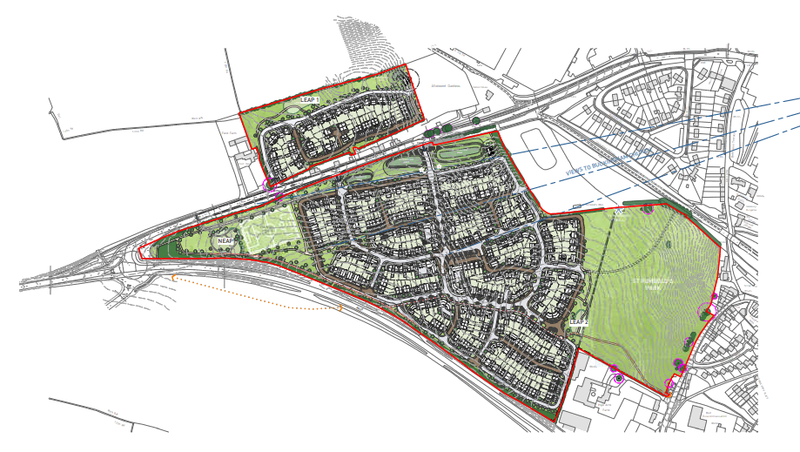 Councillors criticised the assumption that 25% Affordable Housing was acceptable, when the currently valid Plan – Buckingham Neighbourhood Plan – requires 35% (a difference of over 40 houses). It was felt that the figure in force when the plans were submitted should be used, not the proposed figure in the Vale of Aylesbury Local Plan which has not yet been accepted by the Examining Officer. Plan of houses in the Tingewick triangle area of Buckingham. Large green area is site of St Rumbolds Well and Roman archaeological finds. In a huge contrast, Councillors welcomed the recent changes made to the detailed plans for Tingewick site in consultation with Design South East; this was a site designated for housing in the Neighbourhood Plan, and the developers had met and consulted with the Town Council at all stages, gradually refining the outline plan to suit Buckingham styles and other consultees’ requirements. Councillors therefore agreed no objections to the revisions, noting that not all consultees had responded yet. They also stipulated that all houses had to have telecoms connections before occupation. Buckingham Town Council does not make final decisions on planning applications; this is the responsibility of Aylesbury Vale District Council. However the Town Council are a statutory consultee on all planning applications, and make representations to AVDC where the Town Council opposes an application.